The definition of a pound cake is a rich cake containing a pound, or equal weights, of each chief ingredient, typically flour, butter, and sugar. Add chocolate, cinnamon, spicy chile and sour milk and you have a Mexican pound cake. This cake is deeply flavored and encompasses such a lovely, somewhat spongy texture. A wonderful stand alone chocolate cake; no adornment needed. Simply cap with a dusting of confectioners sugar. 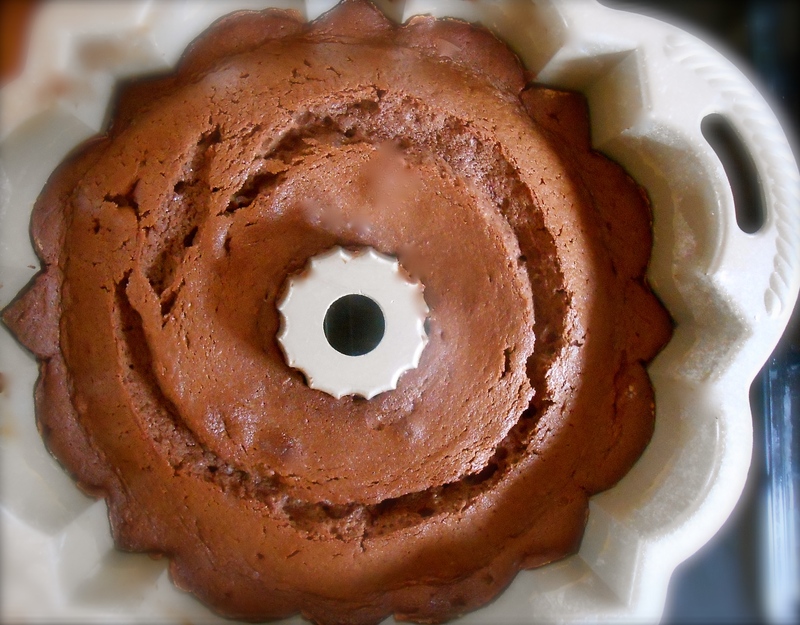 Mexican chocolate cake is a surprisingly delicious spicy cake if you are looking for something to do with your bundt pan. Preheat oven to 325°. Melt the chocolate bar. Beat butter at medium speed with a heavy-duty electric mixer 2 minutes or until creamy. Gradually add granulated sugar, beating 5 to 7 minutes or until light and fluffy. Add eggs, 1 at a time, beating just until yellow disappears after each addition. Stir in melted chocolate, chocolate syrup, and vanilla until smooth. Combine flour and next 4 ingredients; add to butter mixture alternately with buttermilk, beginning and ending with flour mixture. Beat at low speed just until blended after each addition. Pour batter into a buttered and floured bundt pan. Bake at 325° for 1 hour and 10 minutes or until a long wooden pick inserted in center of cake comes out clean. Cool in pan on a wire rack 10 to 15 minutes; remove from pan to wire rack, and let cool completely (about 1 hour and 30 minutes). Sprinkle with powdered sugar, if desired. You can actually make an easy buttermilk substitute: use regular milk with a bit of lemon juice and let stand for about 3 minutes! This looks like a fab way to justify the existence of my bundt pan, which hasn’t been used for about 3 years! The ingredients sound magnificent. Lovely photos too. PS. Soured milk is common in Europe – my Dutch Oma loved serving it to my sister and I. I replace it with buttermilk in recipes, as you have. You can make a substitute by mixing a small amount of lemon juice (1/2 to 1 tbs) into 1 cup of milk. I love it now but to be honest I thoroughly disliked it as a young girl. Oma lived on the Rhine and my sis and I would tip it out into the water when she wasn’t looking. Indeed. It really is wonderful…we really like it. I’ll be making it again for sure. Lovely cake indeed. I am impressed (and hungry). Thank you Conor. I see you torture yourself like I do…look at blogs while hungry! Thank you Ada! I hope you do get the chance to make it. It’s very good and the chile puts a nice spin on a chocolate cake. This looks really delicious. Could I ask…dark chocolate or milk chocolate? Dark chocolate here (Australia) is not sweet and contains from 45 – 70% cocoa solids and no milk – and a little bitter, but very intense and chocolately. Milk chocolate is sweeter and creamier in texture but the chocolate taste is quite mild. Which do you think for this recipe? Hi! I actually used a semi-sweet baking bars, although when I was looking at different versions for this cake I noticed some recipes listed “Mexican chocolate” which is available as a common brand (over here) called Ibarra. Do you have semi-sweet available to you? Oh I bet your kitchen smells divine! Such a wonderful cake, love pound cake, have never had chocolate before this is even better with the spice. YUM!! Hey thanks! How’d you like your chile chocolate? It was deelish! I really like the one that had the sour cherries as well. BTW I found a couple flavours of this brand at my local Save on Foods…but not the chili ones! yes, it was in the special organic section. I bought the dark with salt combo. It was not my favourite. For some reason I think if you’re going to have salted chocolate it always tastes better with milk chocolate. Now I know what a pound cake is! I’ve never bothered to Google that one. Thanks for the explanation. Do love the idea of anything spicy right now. Anything to help alleviate the winter blues, I’m guessing. Have to add, for someone who doesn’t bake very often you certainly seem to know what you’re doing. Is it just me that panics every time I bake something new?! :) busy is good when it has to do with food…right! 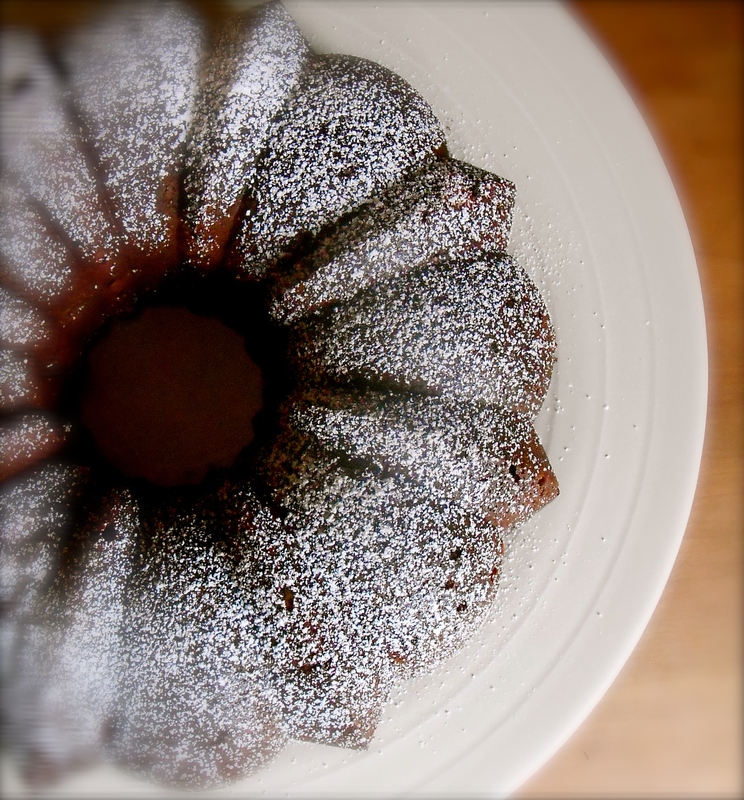 This looks delicious – and your bundt tin is a wonderful shape! I never knew why a pound cake was called as such – thank you for sharing!! Thank you Gab! So nice to hear from you. I really like using the bundt pan and this one in particular. I do like the shape too. OMG this is my kind of cake! YES! Chili powder and chocolate. I am obsessed with spicy chocolate. A cake with a kick is right up my alley. I like when it has more heat than cinnamon. I can only imagine how good this tastes. Great recipe. I’m totally making this. Thanks for sharing. Hi Amanda. We loved this cake and I hope you do make it. I would love to hear your feedback and quite possibly a post?! It is worthy of such and I just know you would really do it right with your latin ingredients expertise! Oh, this looks amazing! Such beautiful photos with the sugar sprinkles, and, do I see steam rising from the cake in the other photo? So enticing, and I love idea of the Mexican spices. I am so making this!!! Thanks for sharing! Thank you…photographer. :) Appreciate your feedback, now go get yourself a bundt pan! I finally did get myself a bunt pan! But not as pretty as yours. Beautiful! I love cinnamon with chocolate! How does that happen? Same things happens over here! That is absolutely gorgeous. Absolutely perfect for an afternoon tea. Clever you, TWC. Hi Rhonda! Thank you and I’m with Larry..I am not a frosting fan either, but I do love cake. Hope you give it a go, even without the chile it’w wonderful! When I was in Mexico – I was surprised to be served chocolate cake with coffee for breakfast. this cake looks exactly like the cake I had – and it was beautiful. Now I think cake and coffee for breakfast is the ultimate way to wake up! Love your recipe and photograph. Oh my! I’ve been thinking about pound cake recently and this looks fantastic!! Lovely cake, looks delicious! :-) Pound cake is one of my favorites and if it is chocolate pound cake the better it is!! You are currently reading mexican chocolate pound cake at COTTAGE GROVE HOUSE.